There is really nothing like a good old-fashioned Thai Red Curry, especially during the cold wintry months. 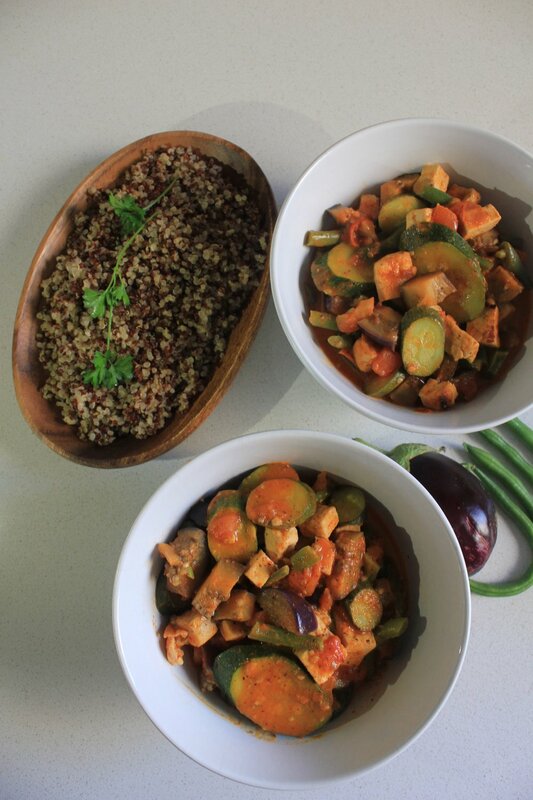 I decided to put a Mediterranean twist on the classic Thai red curry by using vegetables such as tomatoes, green beans, aubergine and baby marrows and the fusion of the two cuisines worked out so well! This recipe is so simple, easy and keeps well in the fridge for a good few days so it really is the ultimate batch-cooking recipe for busy people. 1. Heat a tablespoon of water in a large non-stick pan or wok. Once heated, add the red curry paste, kaffir lime leaves and sauté in the water for a minute or two until sizzling. 2. Add the cubed tofu to the sizzling curry paste and sauté for a further 3 minutes until well coated and slightly crispy. 3. Add the tomato and coconut cream to the tofu and saute for another 2 minutes until warmed through. Then add the aubergine, green beans and baby marrows and turn down to a low simmer for 7-10 minutes or until the vegetables are cooked but still firm and slightly crunchy. 4. Stir in the coconut sugar, dulse granules, baby spinach and thai basil. Turn off the heat and stir through until the spinach is wilted. 5. Serve with your choice of whole-grain noodles, quinoa or brown rice. * Pressing tofu helps to extract any extra water so that your tofu is firm and easy to work with. Simply wrap the tofu in a piece of paper towel or a clean drying cloth and squeeze on each side to release any water. **Thai basil can be hard to find at most supermarkets but feel free to sub with normal basil if necessary. ***Dulse is a type of seaweed that is dried and ground up to make granules. It adds a distinctive “sea” flavour and is also super healthy and packed with iodine. In this recipe, the dulse helps to add a fishy flavour that would usually be given by shrimp paste in traditional Thai cuisine but it is not essential to the dish so feel free to leave it out if you prefer. **** You can find these at any Asian supermarket or Chinese market.